Particularly: Does it drop anything when killed while petrified? If so, the second paragraph needs a rewrite. The Volatile Dweevil (サクレショイグモ?, lit. 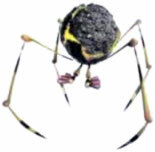 : "Exploding Carrier Spider") is an enemy in Pikmin 2. At first glance, they appear to be bomb-rocks with legs, but are actually Dweevils that have picked up bomb-rocks, much like how other members of the Dweevil family pick up treasures and corpses; unlike other members of that family, Volatile Dweevils are known to only carry bomb-rocks, and are never seen without one. A Volatile Dweevil's bomb-rock will start the count-down fuse as soon as the creature is startled, and it will chase leaders and Pikmin until the bomb explodes, killing itself and anything else caught in the blast. With that in mind, the best way to deal with a Volatile Dweevil is simply to run away from it until it blows up. They cannot be directly attacked unless petrified, which also freezes the bomb-rock in mid-detonation, making it useful in an emergency but often impractical because it wastes a spray on an enemy which will drop no corpse. In terms of gameplay, Volatile Dweevils are more-so hazards than enemies. They can unexpectedly drop from the ceiling and are often found around treasures, making them extremely dangerous to Pikmin attempting to retrieve the treasure. Volatile Dweevils are roulette options in 2-Player Battle. When activated, a Volatile Dweevil drops onto the opponent player, and begins to detonate. It is best to use this power up when the opponent is preoccupied with many tasks. ↑ Although the creature does not leave a corpse, the Piklopedia states its value as specifically 0 instead of the usual "----". Volatile Dweevils frequently fall from the ceilings of in various caves. Once one does, it will proceed to pursue the closest leader or Pikmin. At first it will walk at a moderate pace towards its target, and once it gets considerably close, the bomb-rock on its back will activate and begin a normal countdown until it explodes. The countdown can be sped up by attacking the creature, and once the bomb explodes, the Dweevil will die, leaving behind no corpse, and any Pikmin caught within the radius will also be killed. Additionally, if the Dweevil is lured into any other creatures nearby, the explosion will deal great damage to them, killing small ones, like Dwarf Bulborbs, and taking chunks of HP from larger ones. Before the bomb-rock activates, if the Volatile Dweevil's target escapes its range of interest (this is particularly easy for a leader with the Rush Boots upgrade), then it will switch it target to the next closest leader or Pikmin. If no other targets are nearby, it will go into a dormant state, lowering its head to the ground and remaining dormant. At this point it looks like a bomb-rock with little evidence of thin legs underneath it. The creature will only reactivate once approached again by a leader or Pikmin. Typically, Volatile Dweevils will fall from the ceiling in certain caves, so always be cautious in those caves. If a Volatile Dweevil drops down, it is best to stay near it long enough to begin its count-down process, and then run away to allow it to explode away from your Pikmin. Dealing with Volatile Dweevils while carrying treasures is a little more difficult, as it makes you call your Pikmin back, often more than once. When carrying objects back to your ship pod, and a Volatile Dweevil falls upon your group, you can lead the Dweevil away from the Pikmin with your leaders. Just make sure to get out of the way of the explosion, as it deals a decent chunk of damage to your leaders. "Volatile" means "something that can blow up all of a sudden", which fits the Volatile Dweevil's explosive tendencies. In Japan, it is called サクレショイグモ?, which translates to "Exploding Carrier Spider". Its scientific name, Mandarachnia explodus, has the species name explodus, which is similar to the Latin word exploditus, for explosion. Internally, this enemy is called bombotakara, which is the same name used for all dweevils, but starting with "bomb". Olimar in front of a Volatile Dweevil. The Dweevil's black head is visible here. A Volatile Dweevil about to explode, on the Piklopedia. The creature's e-card, #42 (13th yellow card). In this enemy's Piklopedia entry, petrifying the creature just as it breaks free from another spray makes it possible to freeze it and its bomb-rock separately. It is not known how Louie collects the corpse as it doesn't drop one during the explosion of the bomb rock. This page was last edited on February 16, 2019, at 15:04.